We are almost 2 months into 2016, and with no race/event entered, it's high time I get sorted! Living in SE Queensland there is an abundance of opportunity close by - triathlons, bike, running, obstacle course events... I could go on. My excuse so far this year has been an injured big toe (it's small, but it plays a big role in keeping us upright) - no violins please! Running is my first love so it's been hard not to just pull on my trainers and get out there for 3 months now. As I am a PT, my base level fitness is always quite good, although I am sure my anaerobic threshold and VO2 Max has dropped quite a bit. My toe (you will be thrilled to read) is on the mend, and I can finally start training again. So I need a goal! I am 100% motivated to train by entering events that slightly scare me and that I know will push my fitness and skills to another level. - another 70.3 IM triathlon. My only other long course swim/bike/run was in 2013 at Mooloolaba when I crossed the line in a respectable 5:19:34. Unfortunately, this event does not appear available to age-groupers this year, so thinking about doing the 2km swim and 160km bike at the Noosa Ultimate Sport festival in May, then aiming for Kingscliff Olympic again in November. During all these endurance events, and indeed whilst training, I use the Skin Strong range of chafe protection. Originally designed by two Ironman triathletes (my wife's cousins!) the three products provide a complete anti-chafe system for any swim/bike/run event. I used all three products during the race - SLATHER chamois cream, SLIK spray and DUST powder. 5.15am alarm went off. An early start, although for many in the race it would have been much earlier, my age group wave start time was almost the last to go (8.01am). After a glass of water & a banana, off to transition to set up my gear! In transition I laid everything out ready for T1 - bike helmet and sunnies, race number belt, then bike shoes. I was going sockless on the bike, so had Dusted my bike shoes (shake bottle, turn bottle upside down, squeeze & make sure the powder goes right down to the toe area). DUST also went into my running socks ready for T2 & had some extra SLATHER for a quick rub around toes in T2 before the run. 6.20am transition close & back to the apartment for porridge and coconut water to hydrate. Tried to eat slowly but nerves/adrenaline starting to build! 6.50am stretch, put on Tri-suit and spray SLIK around shoulders and under arms to stop chafing friction in water during swim. SLATHER chamois cream under bike sorts pad. Sunscreen on. Pick up goggles and orange swim hat & goodbyes to wife and 5yr old twin girls (who insist on wearing bright pink tutu dresses so I wouldn't miss them on the course!!). 7.20am walk to start 1.5km from centre of town! 7.50am warm up swim into the river/check goggles all ready to go! 1.5km river swim, 40km bike, 10km run in 2:23:49 = 146th out of 347 happy with that! I was especially pleased with my swim time although very much tide assisted. I calmed my nerves with my favourite 'under pressure' affirmation "I have a fit, strong body, healthy and in peak physical condition" then settled into a rhythm & really enjoyed the swim. Much more fun going with the tide in a stunning location like Kingscliff (I'm sure I saw a few fish) than in a lake/or even the London Docklands where I completed the London Tri many years ago (very cold and black) - I digress! Into T1 and, although distracted by trying to get a split time on my new watch, I felt good and was onto the bike and out onto the road with no real dramas. The SLIK spray had done it's job with no chafing under my arms or around the shoulders and feet now into bike shoes with Dust powder (I did dry my feet quickly on a towel but the powder helps to wick away the remaining moisture). Four laps of 10km on the bike was broken up with "Go Daddy!" cheering from the girls in their pink tutus, a few spots of rain to keep us all cool and plenty of water and coconut energy fuel. Into T2, running shoes on, more DUST to soak up the sweat on my feet and prevent hotspots on the 10km course. Really interesting route along road and a short bit of trail and even some sand right onto beach/esplanade. Last 5km always pushes my fitness and I had to pull out the old verbal "I am strong" mantra again, but I crossed the line with a bit of a kick, so legs must have been just about ok.
Post race analysis: Overall happy, would have liked a quicker bike time - carbon wheels for Christmas perhaps?! Grateful that I was Slik'd, Slather'd and Dust'd! 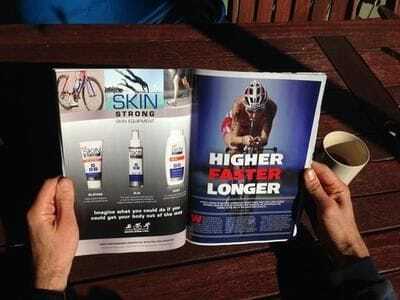 SKIN STRONG - Your #1 for Chafe Protection!